Decisive action: While Khan was penalised for his sexist jibe against BJP candidate Jaya Prada, Gandhi’s ban came after she stirred controversy for asking Muslims in Sultanpur to vote for her if they wanted jobs. Earlier on Monday morning, the poll body had barred UP CM Yogi Adityanath from campaigning for 72 hours and Mayawati for 48 hours. The EC in its order said it was convinced that both the leaders “made highly provocative speech which has the tone and tenor to aggravate existing differences or create mutual hatred between different religious communities”. The poll watchdog pulled up Adityanath over his comment: “Have faith in Ali, we have faith in Bajrangbali”. Meanwhile, the BSP chief was issued a notice for her speech in Deoband, in which she had appealed to the Muslim community to not vote for the Congress. He said she said: The BSP supremo Mayawati in a press conference launched a scathing attack on the EC over the ban and criticized the poll body for its “anti-Dalit mentality”. "The decision by the Election Commission to impose a 48 hour-ban on me was taken under some kind of pressure….I have been denied the fundamental right of freedom of speech and expression. This day will be known as a black day in the history of EC," Mayawati said. Mayawati also remarked that the EC has been unable to do anything against “the real person who violated the Model Code of Conduct – PM Modi”. “PM Modi is using Army for votes while Amit Shah is continuously spreading hate for a certain community, but the EC has no courage to take any kind of action against them,” she said. Not a first: This isn’t the first time that the EC has enforced such a stringent action against politicians over “inflammatory” remarks. Prime Minister Modi himself, during a recent campaign, reminded the electorate about the time when Shiv Sena founder Balasaheb Thackeray faced flak from the Election Commission. In the year 1999, the ECI had debarred Bal Thackeray from contesting election as well as from the right of voting for six years. Such cases of bans were also issued by the ECI in 2014 against Amit Shah, Baba Ramdev, and Azam Khan during the Lok Sabha polls. The spire of Notre-Dame Cathedral in Paris collapsed on Monday as a huge fire ravaged the roof of the landmark structure in central Paris, at a time when renovation works were being carried out at the site. 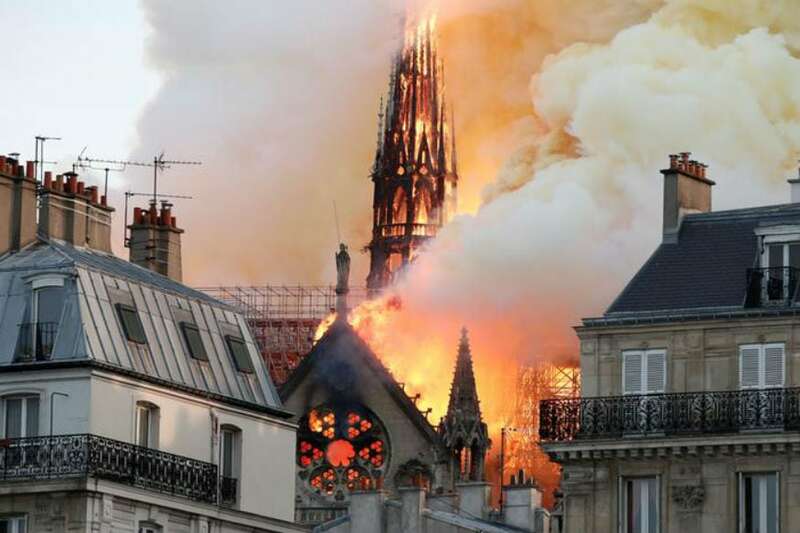 The cathedral, one of the most historic landmarks in Paris and one of the most popular tourist attractions in the world, is at least partially destroyed. As the disaster was unfolding, the Paris Fire service said it would not be able to halt the spread of the fire. The world reacted to the live images of red flames and thick smoke enveloping the roof in centre of Paris, with utter shock and devastation. French President Emmanuel Macron also expressed his desolation over the tragedy and said, “like all my compatriots I am sad to see a part of us burn this evening.” Meanwhile, his US counterpart, Donald Trump, in a tweet suggested that “flying water tankers” be used to fight the Notre Dame fire. The French civil security agency, Sécurité Civile, however, rejected Trump’s advice on the grounds that such a method could aggravate the damage. Jet Airways on Monday said its services on overseas routes will remain grounded until April 18, even as the lenders failed to take a call on extending an emergency funding to the airline. In an internal communication, chief executive Vinay Dube also said the airline's board will meet Tuesday to discuss the next step for the carrier. This is the third time that airline has extended suspension of these flights, which was first announced for last Thursday. The Bharatiya Janata Party on Monday released a fresh list of seven candidates for Uttar Pradesh with Bhojpuri superstar Ravi Kishan and Nishad Party chief's son getting tickets from the eastern UP seat. Keeping in mind the actor's popularity among the Bhojpuri-speaking population of Purvanchal, Kishan has been fielded from Gorakhpur. The actor had met UP CM Yogi Adityanath a few days ago and had announced to fight elections from "wherever the party will ask him to contest". Meanwhile, from the Sant Kabir Nagar seat, the party has decided to field Pravin Nishad, who recently joined the BJP at the same time that his father, Sanjay Nishad, parted ways with the Mahagathbandhan and extended his support to the saffron party. Praveen Nishad had defeated UP CM Yogi Adityanath in the previous elections. Union Social Justice Minister and Republican Party of India(A) president Ramdas Athawale on Monday said the Congress-JD(S) coalition government in Karnataka would not last long and asked Chief Minister HD Kumaraswamy to join hands with the BJP for the state's welfare. "Kumaraswamy is upset, I request him — why are you behind the Congress when the BJP-JD(S) coalition government can be formed? ", Athawale said. The Dalit leader also termed the Congress as "casteist" and said that party president Rahul Gandhi should not dream about becoming Prime Minister. Nandita Das and Manav Kaul, both actor-directors, have teamed up for a new film titled ‘Albert Pinto Ko Gussa Kyun Aata Hai,’ a modern-day retelling of Saeed Mirza’s classic film of the same name. In a freewheeling chat, they opened up about pent-up anger, intolerance, creative freedom and their political views.